The Wings Financial World of Birds Show demonstrates to Zoo guests the natural abilities of birds, the diversity of species on our planet, and the importance of conservation action. From Memorial Day to Labor Day, the Bird Show takes place outside, in the Weesner Family Amphitheater. During the winter months, the show takes place on the state in the Target Learning Center. 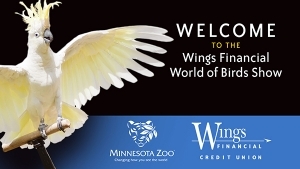 The collection that is featured in the Wings Financial World of Birds show is completely separate from the collection of birds managed by the Minnesota Zoo Bird Department. It consists of 33 birds representing 20 different species. Interns learn how to clean bird enclosures, prepare diet diets, monitor bird feeding and other behaviors, and provide enrichment for the Bird Show collections. Interns learn safe and ethical parrot and raptor handling skills, and develop situational awareness for working around animals in a fast-paced environment. All interns complete an educational program developed in consultation with World of Birds Show staff.